Join Pastry Chef Adrianna Robles of "Good Morning Cupcake" to learn how to make and decorate your own colorful floral cupcake bouquets in this special Sunday baking class. Each student gets a display board, upon which we will tape down the cupcakes in the shape of the flower bouquet. From there, the participants will learn how to make buttercream frosting and how to pipe the stems, leaves and flowers. We will finish off the project with piping a bow to pull it all together. Each participant will be able to take his/her completed project home. Too busy to take a cooking class? Drop off the kiddos at preschool or leave your morning work for two hours, and join us for a casual Italian cooking class tailored to morning people. In this social midmorning class, Chef Vita will teach you to make two springtime staples that you can replicate at home for your family. We'll start with Spring in the Bowl," a light springtime soup made with fresh peas and asparagus. Next, we'll tackle Tagliatelle and Tomato sauce, using farm-fresh eggs. We will prepare the pasta dough and fresh tomato sauce, and top it with freshly grated Parmigiano Reggiano Cheese from Italy. We'll sit down for an early bite at 11, and wrap up in time to get you out the door for preschool pickup or to tackle your to-do list. Using farm-fresh ingredients, this series will take our young chefs around the world, starting in our local gardens! In the farm’s new commercial kitchen, we will cover basic knife skills and cooking techniques, like mise en place (putting everything in its place), while exploring creative ways of making delicious, farm-fresh, simple and nutritious recipes with some ingredients plucked straight out of our own organic gardens! For our Winter series of Cooking Around the Globe, we've got lots of new delicious recipes to share & prepare! From savory warming soups & stews to fresh baked desserts, we've got this winter covered! We're already dreaming of Moroccan Tagine, Mexican Tacos and Indian Chickpea-Coconut Curry, to name just a few! For spring, we'll get ready for the blooming season with a fresh new harvest that will take our spring series from South America to Southeast Asia! The spring global tasting tour may include recipes such as savory Meat & Veggie-filled Empanadas, Alfajores (caramel sandwich cookies) and Chicken Zoodle soup (with zucchini & rice noodles). Of course, eating what we cook is always part of the fun. Let the food journey begin! 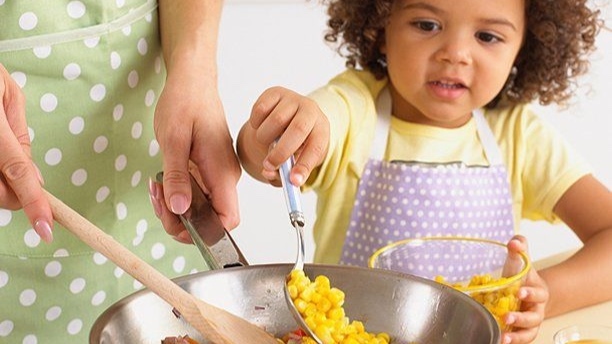 Make a mini sous-chef out of your curious toddler and get those little hands working in the kitchen. Kids will learn how to spread, stir, knead, and season with fun, hands-on recipes. We'll make teddy toast, delicious dips, personal pizzas with favorite toppings, breakfast banana splits, and other delicious snacks, all while learning to try new foods. This class is designed for child and caregiver to enjoy together. Not a drop-off. Class size is limited. Love is in the air at the Farm. We’re baking a variety of Valentine’s-themed cookies, cupcakes and heart-shaped treats with Chef Kathy Oberman. This class is designed for kids grades in elementary-middle school with a more challenging lineup of tasks for the older participants. $110 for both sessions (includes instruction and all materials). Not available separately. In this two-session cooking camp, jr. chefs will learn a few new culinary tips and techniques while having fun with Chef Mia Wiggers. The class is limited to 8 students for the maximum hands-on experience. Session One: Fun with Asian Dumplings. Campers learn to make the filling for authentic Asian-style dumplings, and then learn the techniques to assemble them. We will enjoy them together at the end of class. Session Two: Fun with Melted Chocolates. Campers will learn some of the techniques of being a chocolatier. They will make chocolate-covered strawberries, chocolate- covered candied orange peel, and other tempting confections. We will make enough to take some home! $50 per class, 12 Students max. Jr. Chefs will bake holiday cookies, pies and treats in one or more of our two-hour holiday-inspired classes, and learn a few cool culinary tips and tricks along the way. Limited to 12 students. First-come, first served. Reserve your space at wakemantownfarm@gmail.com. Join us for a Chocolate Easter Egg Decorating Class with Aarti of Le Rouge Chocolates at Wakeman Town Farm. All you need is enthusiasm and you will walk away with handmade and handpainted eggs, just in time for Easter! You will paint 6 mini eggs and 1 medium egg. Other items available to purchase separately. I scream, you scream, we all scream for ice cream! Do your kids love ice cream? Have them come learn to make it from scratch with Chef Mia in this four-class series. We will be making it in an ice cream maker and will also learn to make homemade sorbet, tuille cookies, and sauces. If you are lucky, they will make it for you at home!